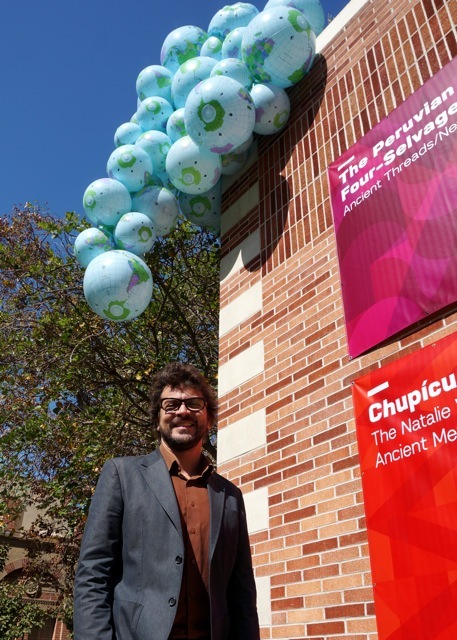 The Fowler Museum at UCLA is celebrating its 50th anniversary in a big way. And I mean, big. Last week I attended a preview and opening event for Fowler at Fifty (photo below), the Museum’s suite of eight anniversary exhibitions showcasing nearly 1,000 objects from its acclaimed global collections. Fowler at Fifty offers a diverse array of objects spanning more than a thousand years of human creativity and innovation, from ancient Mexican ceramics to African Zulu beaded body adornments. All eight exhibitions will be on view until January 26, 2014, and several until March 2, 2014. But visit the Fowler soon because you can only see Walk Among Worlds, a monumental outdoor installation by Mexican City-based artist Máximo González (photo below), for a few weeks (now through November 3rd). 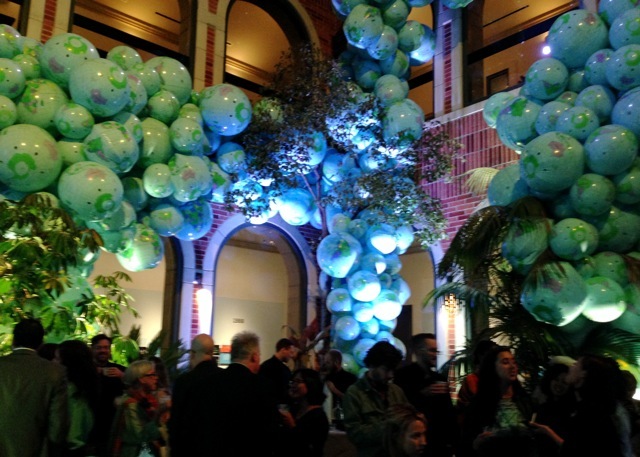 Walk Among Worlds incorporates thousands of colorful beach ball globes that appear to float over the Fowler’s exterior and inner courtyard (photo below). González hopes his installation will inspire us to rethink our perception of the world, to see it as “an accumulation of parallel worlds; some more visible than others, some closer or more distant, but all part of the same organic vital structure” (Iván Buenader, 2013). Together, Walk Among Worlds and Fowler at Fifty celebrate the Fowler’s remarkable achievements over the last five decades. They also shed new light on the Museum’s expansive collection of 120,000 objects — “It’s vast, it’s deep, it’s broad, it’s thrilling, Berns said.” Take a trip to the Fowler and I’m sure you’ll agree. Stay tuned, and be sure to subscribe, to hear more about Fowler at Fifty and other exciting L.A. museum exhibitions. There’s nothing like seeing Walk Among Worlds at night (photo above). So mark your calendar for Draw Among Worlds at the Fowler, Thursday evening, October 24, 6:00pm. Listen to a guided live soundscape created by “3-D composer” Mike D’Errico as you draw under the stars in the Museum’s courtyard. Free, Big Draw L.A. event. The Fowler Museum is located on the UCLA campus in Westwood.